2. Turn on the Power Switch, the detector starts to preheat, and LED screen will display the count-down. 3. Calibrate: After count-down ending, take the detector outdoors in fresh air environment for 8 minutes, and then press the button 3 seconds calibrate to zero. After calibration, the detector is ready for use. 4. Star to detect: Take it indoors and wait for above 2 min to read the result. 5. After finishing detecting, turn off the power switch, and then keep it well. a. If HCHO density≤0.10 mg/m3, it means air quality is good. c. If HCHO density >0.30 mg/m3, the alarm rings 6 times, it means air quality is worse. ★DURABLE： The formaldehyde detector meter is adopted quality PE material for shell, good touch feeling, non-toxic, eco-friendly and durable to use. 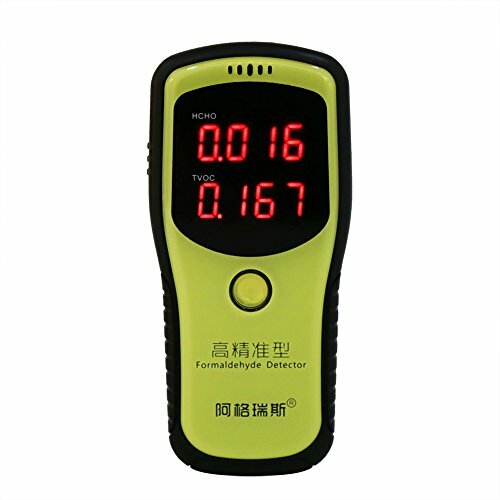 ★MULTIFUNCTION：The formaldehyde detector meter can analyze air quality and detect HCHO and TVOC is suitable for new furniture & decoration, living room, for the new car etc. ★BACKLIGHT READING： Big electronic screen, clear display, convenient for your reading. ★ACCURATE TESTING： Strong anti-interference, detect more accurate. ★WITH CALIBRATION FUNCTION： Calibrate the meter under better quality air condition, such as balcony or outdoor bush. With usual calibration, the formaldehyde detector will work more accurately.